Why Conduct a Board Appraisal? Why use a Third Party to Facilitate? Independent facilitation lends objectivity to a board appraisal. It provides a non-threatening medium through which directors can provide frank input, enhancing the credibility of the appraisal process. 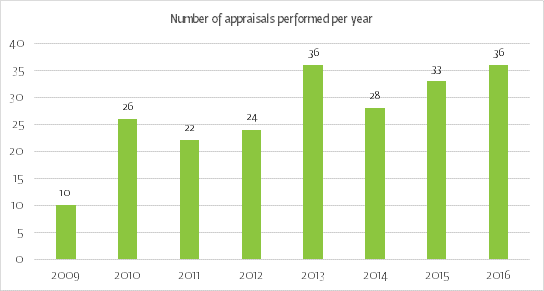 Over 200 appraisals and 8 years’ experience. Facilitation is conducted by experienced currently serving directors who understand the practicality of boards. Robust methodology based on good governance as espoused by the King Reports. Action plan workshops to address the board appraisal findings. Value add through the identification of reference/guidance material to address areas of improvement identified in the appraisal. Integration of other IoDSA services to ensure the successful implementation of recommendations made to address appraisal findings. Let the IoDSA help you gain the competitive edge by getting the most out of your board. Contact us today to receive a proposal for a board appraisal for your organisation.